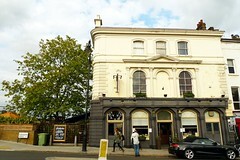 Pub near Chalk Farm Station in Primrose Hill. It was previously owned by the Bramwell Pub Company (formerly Barracuda), but according to the August/September 2014 London Drinker, it was sold to the Stonegate Pub Company in November 2013. We haven't visited since the change of ownership, so some of the information below may be out of date. Inside, the place is all shining wooden surfaces, well-kept and cared for, with a mirrored bar back and a generally pretty image of 'pubbiness'. There's a mix of different sized tables inside, on two levels, with a step up to the beer garden area, which is itself on two wooden patio levels and with plenty of seating (and a range of low and high tables). An abundance of foliage ensures that the outdoor space is nicely broken-up, and a large canopy covers most of the lower level of outdoor seating. Music was playing on Ewan's early evening visit in July 2011, but not too loudly. The place was busy, but not packed. There are three handpulls for ale at the bar, with Butcombe Bitter, Exmoor Gold, and Sharp's Doom Bar on a July 2011 visit. A typical range of keg beers is also available, including Hoegaarden, Leffe and Beck's Vier, as well as a wine list. Food is available from a reasonably lengthy menu, including a number of pizzas, and mains typically priced at around £8-£10. Ewan tried a goat's cheese pizza (£9), which if lacking a bit in flavour was still perfectly decent, on a thin crispy base, and quite large. Ewan's verdict: The location is as good a guide as any to the kind of clientele you might encounter here, but caught at the right time (early mid-week evening) it's not too bad, and the food is decent. Last visited by Ewan and Kerry, 6 July 2011. Opening hours taken from the Bramwell Pub Company website, February 2013. Last edited 2014-08-02 12:26:56 (version 5; diff). List all versions. Page last edited 2014-08-02 12:26:56 (version 5).